Healthcare organizations in America face an enormous challenge. Baby Boomers are passing the 65+ threshold at a rate of 10,000 people a day—a trend that will continue for the next two decades. As a result, geriatric medicine and long-term care will dominate healthcare discussions for the foreseeable future. How will these shifting demographics, often referred to as the “Graying of America,” impact healthcare over the next 5, 10 or even 20 years? In the first of a series on this topic, we’re taking a look at some of the challenges related to chronic conditions associated with age and how psychographic segmentation can be an effective tool for improving engagement with older patients, as well as their family caregivers. Any healthcare system would be taxed by the steady increase in older patients who are statistically more likely to suffer from one or more chronic conditions. In addition to the fact that 70 percent of U.S. deaths can be attributed to chronic disease, the Centers for Disease Control and Prevention (CDC) estimates that chronic health problems account for more than three-quarters of the $2.7 trillion in annual medical care spending. According to the American Heart Association, the aging Baby Boomer population will lead to a tripling of the cost of treating cardiovascular disease, from $273 billion in 2010 to $818 billion by 2030. The CDC also reports that the direct medical costs associated with diabetes in 2012 was $176 billion, a number that is likely to rise significantly with the aging population. In addition, the latest healthcare industry outlook from PwC indicates that diabetes and obesity are on the rise, in large part due to sedentary lifestyles. This coincides with a Gallup and Healthways poll last year that saw obesity climbing across all age demographics, but particularly among adults ages 65 and older. Is it Too Late to Impact Chronic Conditions in Aging Americans? The good news about today’s aging population is that they are more tech-savvy than their predecessors. While geriatric care right now must manage patients that may be reluctant to adopt useful health technology, Baby Boomers are breaking that mold. At a tech forum earlier this year, Joseph Coughllin director of the AgeLab at the Massachusetts Institute of Technology told attendees that Baby Boomers “are not a generation new to technology. Automated teller machines and cellphones, among other technologies were developed during their lifetimes, so they have grown to expect that technology will improve their lives.” That’s good news, because with the influx of older patients, remote monitoring and telehealth consultations will be useful tools in managing both patient volume and the chronic conditions that Baby Boomers face. In fact, the home health technologies market is estimated to grow by more than $10 billion before the end of this decade, says Fierce Health IT. In the words of New Yorker writer, Boston surgeon and public health researcher Atul Gawande, “Good medical care can influence which direction a person’s old age will take.” So too can proactive, health-conscious behaviors. The problem lies in motivating today’s Baby Boomers to make the necessary changes to turn back the clock—at least when it comes to chronic conditions like obesity, diabetes and high blood pressure. With the help of psychographic segmentation, healthcare providers can identify what really drives individuals—their attitudes about health, their trusted sources of wellness information—and nurture better health for the aging population that is sure to reshape healthcare in the coming years. Psychographics pertain to people’s attitudes, values, personalities and motivations. Segmenting healthcare consumers according to psychographics can group people according to similarities in motivation and approaches to health and wellness. Each segment responds to unique messaging and communications preferences, such as media vehicle and frequency of message. Thus, one would not approach Baby Boomers like a homogenous population with a “one size fits all” campaign to be effective. c2b solutions has identified five distinct psychographic segments among healthcare consumers, and these segments are found among all demographic and socioeconomic groups, as well as among patients with specific health conditions. However, the distribution of these psychographic segments may vary across such populations. 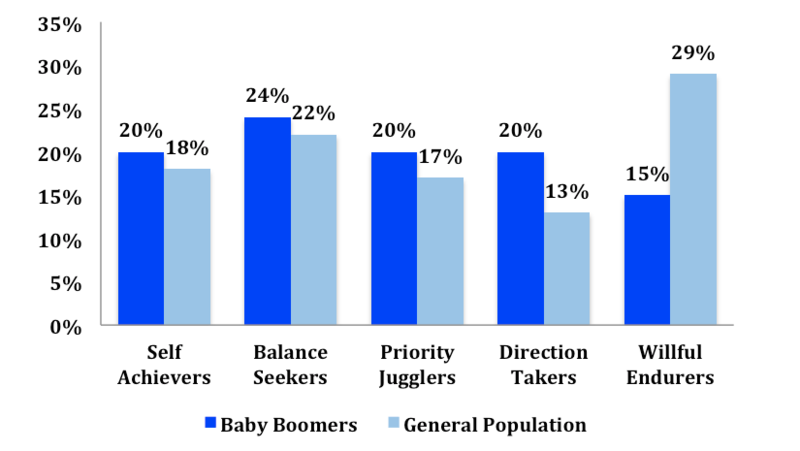 For instance, among Baby Boomers, there is a marked overdevelopment among the Direction Takers segment and under-representation among Willful Endurers. This may bode well for healthcare providers, as Willful Endurers are the most challenging to activate toward healthy behaviors; however, clinicians need to know the triggers and communication preferences for each segment to most effectively address the challenges facing them through this demographic shift.